It's the easiest way to blow up a vehicle in Grand Theft Auto. Just shoot up the gas tank, boom, and you've got a nifty little explosion on your hands. That's entertaining in video games, sure, but when it's real life and you're in a real war zone, the prospect of such an event occurring is downright terrifying. A common misconception of fuel explosions is that they're caused by a spark in a big pool of gasoline, but that's not quite correct. For gas to explode, it actually needs to be mixed with air in a vaporous form, and that's where the real danger is. A fuel tank can actually take dozens of hits, as long as the fuel inside is kept in a tight enough space. When pierced with a bullet, fuel spurting out of the hole reacts with a secret catalyst in the polyurethane, causing it to absorb fuel and expand, plugging the leak within seconds. 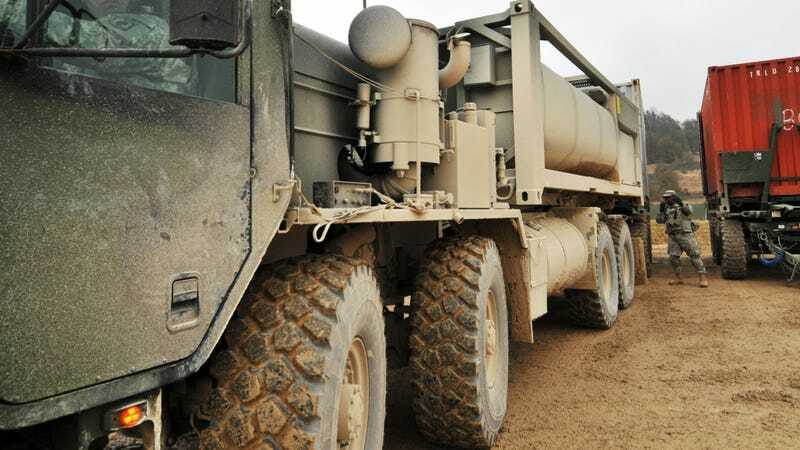 The system, called BattleJacket, now protects more than 3,400 fuel-hauling trucks in conflict zones. In 2008 more than 600 bullets were removed from the reservoir of one of them in Balad, Iraq. The truck was still moving fuel for the US Army but the bullets and shrapnel had begun to clog the reservoir’s drainage valve. You know you've got a tough fuel tank when your only problem is that bullets have started to clog the valve.